Not here. Not on this removable grass field installed in 2006, which a team of engineers and helpers roll in and out of the air-conditioned stadium on a daily basis in an operation that takes a little more than an hour. Its home for most of the year is a vast expanse south of the stadium, just outside massive airplane hangar-style doors, where it is fed city water that soaks through layers of Bermuda grass, soil, sand, rock and, finally, an 11-year-old rubber membrane. The whole thing is due for a change-out this offseason, which is a shame, because Dawson’s made some memories on it. 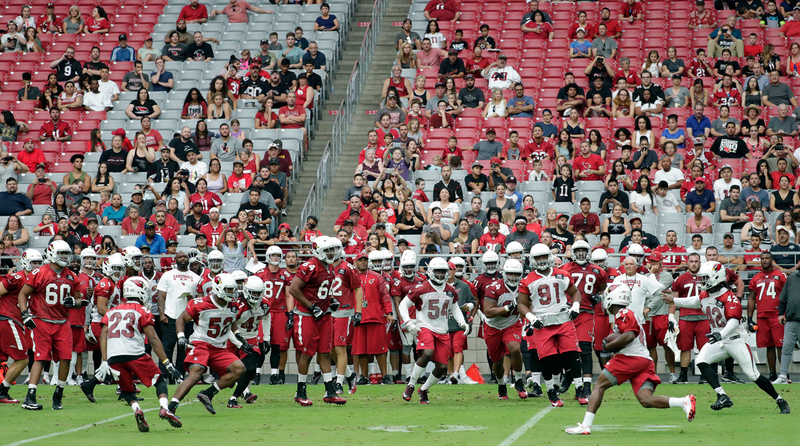 The Cardinals were the first team to crack camp on Saturday. The rest of the NFL follows suit over the next several days. That lone blemish on his record in Glendale—a 24-yard miss on Dec. 29, 2013 (with the laces facing in, mind you)—was followed by a career-long-tying 56-yarder and a 40-yard game winner as time expired. The quarterback of the winning team was Colin Kaepernick. The head coach was Jim Harbaugh. Much has changed, but this sweet, 19-million pound baby crawling in front of Dawson never has. Good morning. It’s football season. As I fill in for my boss Peter King, who is squeezing in one more week of vacation before returning next Monday, here’s what’s ahead: More on the Cardinals and what I think is the hardest non-quarterback job in the NFL, and the two men fighting tooth and nail for it; I take a shot at a pre-training camp Fine 15 complete with the No. 1 priority for all 32 teams over the next month; we’ll also take stock of the stunning hypocrisy of a former superstar quarterback and run down my favorite reads of the NFL offseason. But first, a check-in with the two teams whose success or failure will dictate the ambitions of the NFL for years to come. Los Angeles, that elusive jewel of the west coast that saw two franchises flee in the ’90s, now once again has two NFL franchises. A notoriously capricious community of fans will be expected to split its rooting interests between the Rams and the Chargers, two teams that combined for a 9–23 record last year. For first-year head coaches Anthony Lynn (Chargers) and Sean McVay (Rams), it’s win or go home. It’s with this overarching sense of organizational urgency that the Raiders took to Los Angeles in 1982 following team owner Al Davis’s public feud with the city of Oakland and NFL ownership at large. The Raiders coach then, Tom Flores, took a 7-9 team with aging stars to a city with little patience for losers and in short order identified the nucleus of a team that wouldn’t have another losing season until 1987. Oh, and 1982 was a strike year. Flores’s team finished 8-1 in 1982, taking advantage of a number of circumstances these Rams and Chargers won’t enjoy. He had a Super Bowl champion quarterback in Jim Plunkett, continuity on his coaching staff, veterans with playoff experience, and the benefit of a pre-internet existence (“There were a lot of things that happened that would end up on YouTube today, and honestly they would be pretty funny, if you’re not running the team,” Flores says.) The only thing either of these teams have in common with Flores’s Raiders is the venue; the Rams will once again play in the cavernous 93,000-seat L.A. Memorial Coliseum. The Chargers will play at the 27,000-seat StubHub Center in Carson, home of Major League Soccer’s Los Angeles Galaxy. After minicamp in San Diego, Branden Albert and the Chargers make the move to Costa Mesa for the start of training camp Saturday. • During OTAs this year, the former NFL running back turned Rex Ryan protégé turned first-time head coach told his team explicitly that no one was to hit the ground during team drills. Under no circumstances, Lynn said, should a tackler bring a ballcarrier to the ground during the non-padded practice. This is common practice during the non-padded portion of the NFL offseason, but rarely are there significant consequences for the occasional lapse. Mistakes happen. Men who weigh more than 200 pounds and run 40 yards in under five seconds often don’t know their own strength. • Lynn’s new boss, 44-year-old general manager Tom Telesco, has long had a hand not only in roster building, but also in roster and depth chart organization. Where some GMs across the NFL are content to buy the groceries and let the head coach prepare the meal, Telesco is not. Former head coach Mike McCoy, himself a first-timer when the Chargers hired him in 2013, operated on those terms with Telesco until his firing after the 2016 season, the team’s second losing campaign in a row. Lynn, on the other hand, has been more assertive from the get-go, intent to win or lose by his own design. It's been refreshing to many of those who have had a hand in the team’s slip from 9-7 and a playoff berth in 2013 to the AFC West doormat. Getting second-year quarterback Jared Goff on the same page with new coach Sean McVay will be a priority for the Rams during training camp. The bigger unknown when it came to McVay’s hiring was how his age (31) would translate into ability to lead and manage a football team of 53 egos and personalities on a middling franchise one year into relocating to the second-most populous city in the United States. Andrew Whitworth took the leap of faith when he left the team that drafted him in 2006, the Bengals, to join the Rams at 35 years old on a three-year, $36 million contract to anchor an offensive line that allowed 49 sacks in 2016. Whitworth is one of two players on the roster who is older than McVay—who was a high school freshman quarterback running the triple option at Marist School in Atlanta when Whitworth was a redshirt freshman at LSU in 2001. Adding Whitworth may prove to be the best decision McVay and GM Les Snead have made early in the process of turning around the Rams, not simply for his pass blocking but for his experience in McVay’s offense. The scheme Whitworth learned under Jay Gruden in Cincinnati is, with slight variations, the same one McVay learned under Gruden in Washington. Former No. 1 overall pick Jared Goff spends much of his time with Whitworth quizzing him on how Andy Dalton handled certain situations in the offense. In Whitworth’s estimation, the message McVay would deliver this summer would resonate and had the potential to set a permanent tone for the season, good or bad. “You listen to him talk about defense, offense, special teams and you realize this guy knows football like no other. He’s special in that way,” Whitworth says. “But there’s something else that makes him special. I would imagine its very hard for a coach of his age to be as assertive as he has and cover the topics he has in a team meeting setting. Talking about character, about being accountable to one another, focus, discipline, the way we communicate with other. 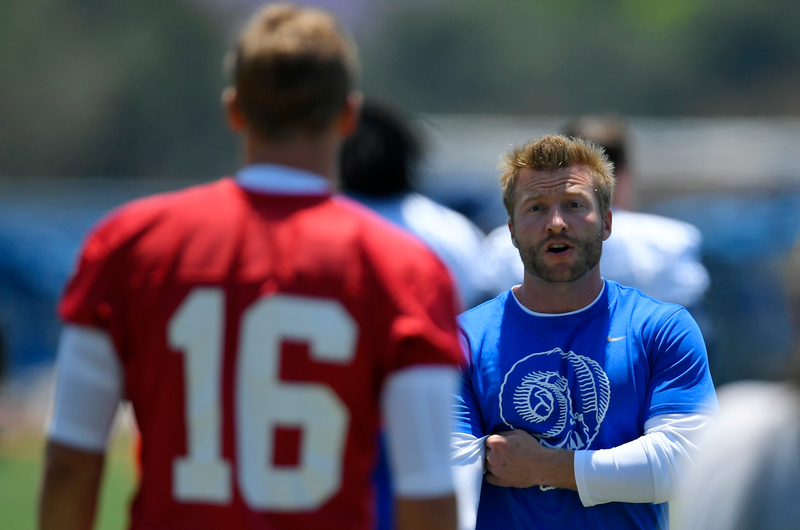 McVay has introduced in his short time with the football team a theme of competition. Whitworth says it was not as strong in Cincinnati, where he played in six playoff games between 2009 and 2015, losing each. Minicamp was an offense vs. defense battle royale more than it was a cut-and-dried installation period, with McVay turning two-minute drills and other team activities into games, assigning points for first downs, turnovers and defensive stops. Losing sides ran gassers. It was all refreshingly collegial, Whitworth says. “I think one of the coolest things we did in OTAs was create competition times where it’s not just scripted plays,” Whitworth says. “It’s always a positive to create competition when you’re starting a football team. It’s a big step towards being the best version of yourselves. Back to Phoenix, and for my money, the hardest job in football outside of the 32 quarterbacks. 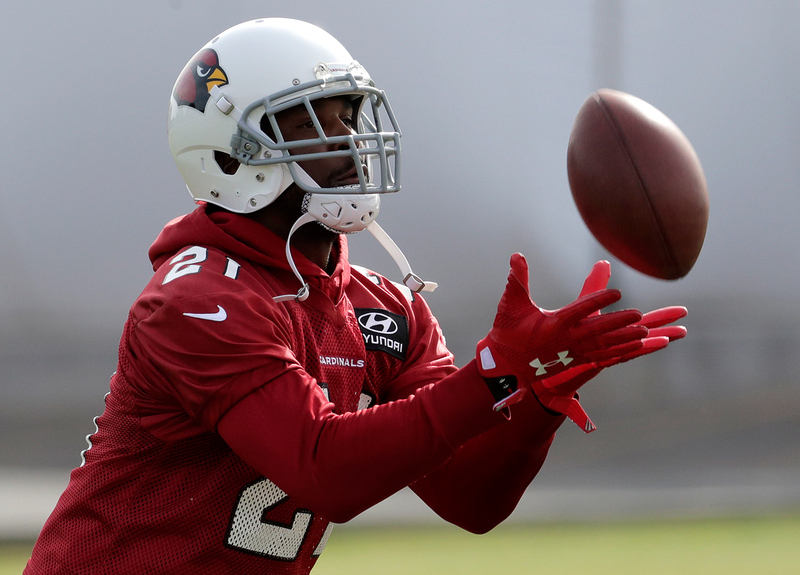 Bruce Arians has a go-to expression about summer practices: “You’re gonna get exposure or you’re gonna get exposed.” Sixth-year cornerback Justin Bethel figures the phrase applies just as well to the job of playing cornerback opposite Patrick Peterson. Among starting corners who played all 16 games in 2016, only Chris Harris had fewer targets (72) than Peterson, who allowed 43 catches on 74 targets for 539 yards and two touchdowns, with three interceptions. The performance landed Peterson a sixth consecutive Pro Bowl appearance in an otherwise disappointing season for the Cardinals (7-8-1). What makes Peterson special, and what sets him apart from the rest of the league, is his ability to shut down the best receivers in the NFL in man coverage for entire games. He led the league in coverage snaps versus the other team’s No. 1 receiver with 259, per Pro Football Focus, and in last season’s Week 12 game against the Falcons, he limited Julio Jones to three catches for 31 yards when they were matched up. So where do the rest of the targets go? In that Cardinals-Falcons game, Mohamed Sanu and Taylor Gabriel combined for 13 catches for 140 yards and two touchdowns. Much of that success came against Marcus Cooper, whose single season in Arizona was of model of inconsistency. Still, he led the team with four interceptions and signed a three-year, $16 million deal in Chicago. Now the job goes to either Brandon Williams, last year’s third-round pick and a former college running back who moved to corner as a senior, or Justin Bethel, a three-time special teams Pro Bowler and the first draft pick ever produced by Presbyterian College in Clinton, S.C. (2012, sixth round). The competition is such that both Williams and Bethel stayed in Arizona and worked on conditioning and technique with the trainer who works with Peterson, former NFL defensive back Rod Hood. Unlike Bethel, Williams prefers not to ascribe any special significance to the job opposite Peterson. Both Williams and Bethel are improving daily, with the former still learning the nuances of the position and the latter finally looking healthy after suffering a nagging foot injury early last season that limited his lateral mobility. Arians, who made headlines last winter when he said Bethel was a “failure in progress,” says this offseason Bethel has had his hands on the football more than any other defensive back. • 24 HOURS WITH PATRICK PETERSON: The shutdown corner shows The MMQB his life at home, on the field, inside the film room, at the golf course and inside his beloved garage. 1. PATRIOTS (2016 season record: 14–2): The Super Bowl champions were 11–0 without former all pro tight end Rob Gronkowski in 2016, so … yeah. Key to camp: Who’s going to play nickel corner among Eric Rowe, Cyrus Jones and Jonathan Jones, and how will the defensive backfield adjust to the addition of Stephon Gilmore? 2. STEELERS (11–5): I’m banking on two big ifs with this team. If Martavis Bryant can return to 2015 form, and if Alejandro Villanueva is the stud left tackle he appeared to be towards the end of ’16, this is the AFC team with the best chance to unseat the Pats. Key to camp: Who among these talented wide receivers will rise into a consistent No. 2 option for Ben Roethlisberger? 3. RAIDERS (12–4): Let’s see how the offense transitions to new coordinator Todd Downing in his first opportunity to call plays. Key to camp: Those haranguing Sean Smith, Oakland’s 2016 high-priced free-agent cornerback, for his very visible struggles in coverage in 2016 are loathe to acknowledge the Raiders finished dead last in the NFL in sacks. All eyes on third-round defensive tackle Eddie Vanderdoes and veteran defensive end Mario Edwards, who missed almost all of 2016 with a hip injury. 4. PACKERS (10–6): I believe in Aaron Rodgers. I don’t believe in this offensive line. Losing T.J. Lang, Josh Sitton and JC Tretter will hurt, at least in the beginning. Key to camp: Getting Martellus Bennett and Rodgers on the same page, early, and figuring out if one of the rookie running backs can complement Ty Montgomery and his limited pass-pro ability. 5. SEAHAWKS (10-5-1): I don’t trust this offensive line either, and I think it's only a matter of time before the beatings take a toll on Russell Wilson. Key to camp: Between Eddie Lacy, Thomas Rawls and C.J. Prosise, who will earn the most carries? 6. FALCONS (11–5): Go back 10 years in NFL history and you will not find one instance of a Super Bowl team replacing a coordinator the following year with someone new to the organization. Steve Sarkisian, the former Alabama coordinator who takes over the Atlanta offense, has his work cut out. Key to camp: Sarkisian and passing game coordinator Raheem Morris hammering out an effective routine for weekly game prep. 7. BUCCANEERS (9–7): Improved by three wins a year ago, compared to 2015, with Mike Evans leading the league in targets. 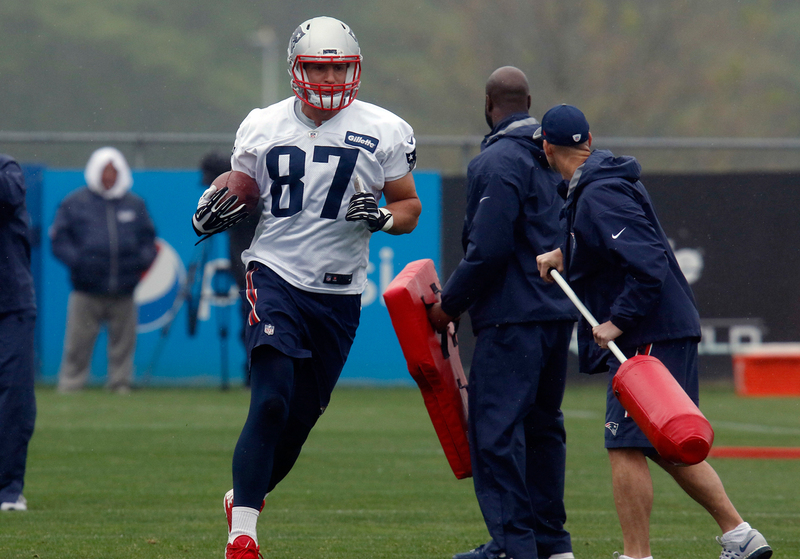 The addition of rookie tight end O.J. Howard and vet receiver DeSean Jackson makes the Bucs my breakout pick. Key to camp: Can free agent safety J.J. Wilcox and second-round rookie Justin Evans acclimate fast enough to start from Day 1? 8. TITANS (9–7): So hot right now. Much hinges on a revamped secondary with newcomers Logan Ryan, Johnathan Cyprien and first-round corner Adoree’ Jackson. Key to camp: Among newcomers Eric Decker, Corey Davis and Taywan Taylor, who’s the No. 2 receiver on this roster? 9. COWBOYS (13–3): A young, restocked secondary will lean on Byron Jones, and pray that first-round pick Taco Charlton has an immediate impact on the defensive line. Ezekiel Elliott’s offseason drama isn’t doing anybody any favors. Key to camp: What kind of impact can 2016 second-round pick Jaylon Smith have at linebacker in his long-awaited return from a knee injury? 10. DOLPHINS (10–6): Not-so-bold prediction: Despite Miami’s gains, a Ryan Tannehill team will not win the AFC East as long as Tom Brady is in uniform. Key to camp: Can rookie defensive additions Charles Harris and Raekwon McMillan break into the starting lineup and improve one of league’s poorest run defenses? 11. EAGLES (7–9): Will challenge Dallas in the NFC East on the strength of a tremendous offensive line and an underrated pass rush. Key to camp: Hammering down the interior line with Allen Barbre, Chance Warmack and Isaac Seumalo all fighting for one guard spot. 12. CARDINALS (7-8-1): Urgency will bring the best out of a rested Carson Palmer at age 37. 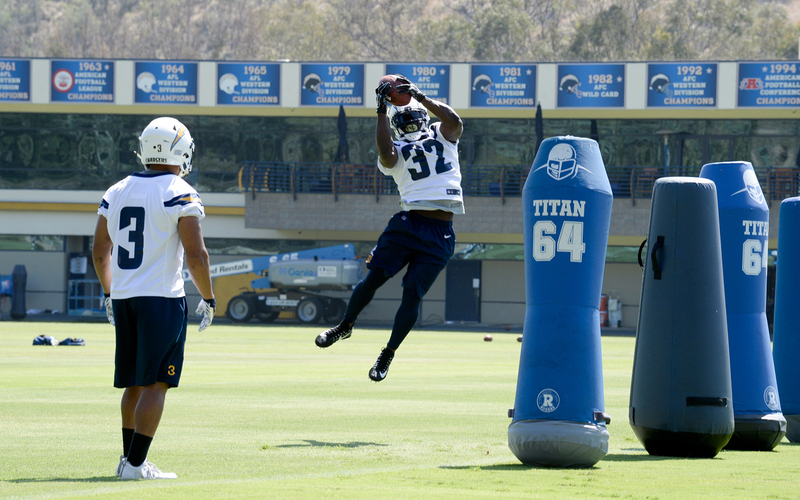 Key to camp: The maturation of wide receivers John Brown, Jaron Brown and J.J. Nelson needs to accelerate. 13. BRONCOS (9–7): Minus clarity at quarterback, world-class defense will keep the Broncos consistent, if not spectacular. Key to camp: This one’s easy—Trevor Siemian or Paxton Lynch? Make a decision and stick to it. 14. CHIEFS (12–4): Bold prediction: Alex Smith’s starting role will not survive this three-game nightmare stretch in October—vs. Steelers, at Raiders, vs. Broncos. Key to camp: Among Tyreek Hill, Chris Conley and Albert Wilson, is there a No. 1 receiver on the roster? 15. PANTHERS (6–10): It gets dicey here, and the NFC South will be stacked, but I like the Panthers with Christian McCaffrey better than the Saints without Brandin Cooks. Key to camp: Michael Oher is out, leaving a big hole at right tackle. If rookie Taylor Moton isn’t ready, who’s up for the job? 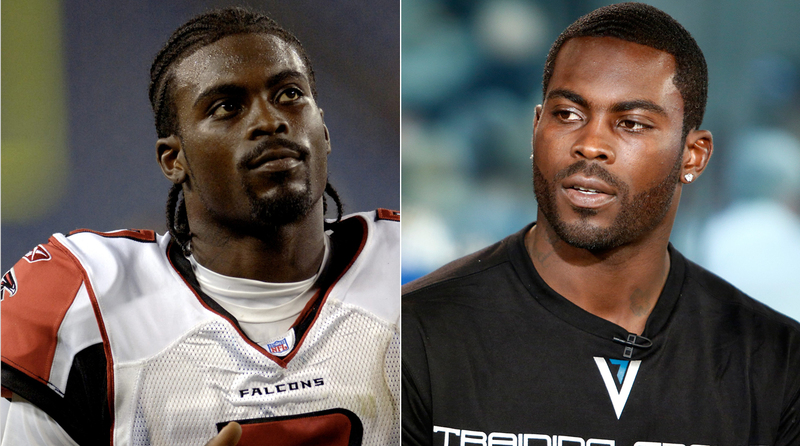 Michael Vick often wore his hair in cornrows before adopting a different hairstyle later in his career. The former NFL quarterback’s comments dominated the NFL news cycle early last week, and the backlash included several commentaries that drew the distinction between Vick’s shedding of his own cornrows in 2007 while under investigation for running a dog fighting operation and Kaepernick’s current situation as a free-agent quarterback who many believe is being blackballed by the NFL for his outspoken political views. That comparison, say people who were close to Vick in 2007, is flawed. Vick, who showed up at offseason workouts that year with his hair close-cropped, didn’t do it because he was under investigation and desperate to portray a choirboy image. He did so because he had grown weary of seeing athletes on par with his level of celebrity and success being offered endorsement opportunities that weren’t available to him. Madison Avenue, Vick was told by professionals in his orbit, would not put a cornrowed quarterback next to Derek Jeter in a razor commercial. It wasn’t because the look was especially unappealing, but rather that the American audience associated the hairstyle with black crime and violence. For years Vick told confidants he had no intention of shedding his baggy white tees, Air Force One shoes and braids for a business suit and buzzcut, because, as he said again and again, he was “keeping it real.” But the lack of major endorsements irked him endlessly, so Vick cut his hair in hopes of a new level of fame. Instead, he gained nationwide infamy upon pleading guilty to felony charges relating to dogfighting in August 2007. Vick walked back his Kaepernick comments last week, writing on Twitter that Kaepernick’s hair had nothing to do with his unemployment. And that’s technically true. The hairstyle in itself, minus its contemporary context for black men, wouldn’t prevent anybody from earning a job as a quarterback in the NFL. When female UFC fighters sport cornrows it’s seen as a matter of practicality, not a statement of ideology or cultural identity. But what it’s come to represent for an entire generation of young black men is a certain brand of defiance that is often unsavory to the men with checkbooks. Vick’s cornrows, like his freewheeling, barrier-busting play on the field, once represented to him the culture from which he emerged—a pointed antithesis to the CEO image he was being urged to convey for the sake of his team's image and his own bank account. Kaepernick’s braids represent to him the culture and causes he’s embraced in his personal war on police brutality and systemic racism. For Vick then, and Kaepernick now, cornrows represent something unapologetically black. Enticed by the specter of career prosperity, Vick forgot that. Kaepernick has not. The appropriate kickoff to any respectable Twitter rant. Kyrie for Garoppolo makes a lot of sense. Cleveland finally gets its quarterback. Kyrie back to scoring 25 ppg for a championship team. Here's the problem with modern day reporters. They don't appreciate the love for the game. He’s right. I hate football. Why would Kirk Cousins not want to sign w/ a team that released all the private behind the scenes info from his negotiation in a statement? Panthers re-hired same GM they fired in 2012. Jaguars first-rounder arrested for throwing a dude's liquor in a lake. In NFL history, 24 players have been targeted more than 180 times in a season, and not one of them won a Super Bowl during said season. The first to reach the threshold was Sterling Sharpe with the Packers in 1993, and the last three receivers to be so relied on each had more than 180 targets in 2015: Antonio Brown, DeAndre Hopkins and Julio Jones. The Falcons, of course, added Mohamed Sanu and Taylor Gabriel, brought down Jones’ targets from 203 in 16 games to 129 in 14 games, and nearly won a Super Bowl in the process. Lesson learned: The only thing gained when leaning heavily on a superstar receiver is another year of high mileage on his body. Nobody plays more zone coverage than Carolina, and it’s not even close. According to Pro Football Focus, the Panthers were in zone schemes on 87% of passing plays in 2016, a full six percentage points ahead of the next zone-happy club, the Steelers. PFF’s Scott Barrett writes that generally speaking, “Defenses with weaker cornerback talent also tend to play more zone coverage.” It is perhaps no coincidence then that Carolina’s pass defense slipped from 11th in yards allowed to 29th with the loss of Josh Norman in free agency. By comparison, the team most reliant on man defense, Kansas City (53.3% man), led the league in interceptions with 18 and held five of its final 10 opponents to under 200 yards passing. The article, which discusses which quarterbacks prefer facing man or zone defense the most, is worth your time. 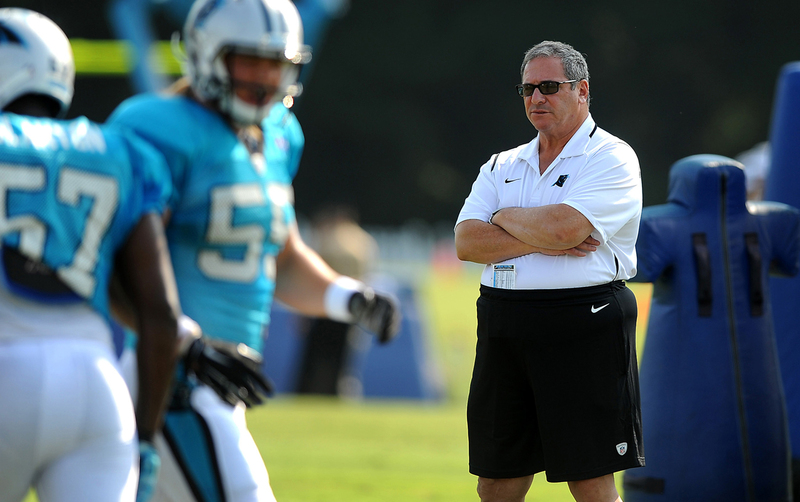 Dave Gettleman’s four-year tenure as Panthers GM ended when he was fired last week. a. Joe Person and Scott Fowler of the Charlotte Observer break down the surprise Dave Gettleman firing as only extremely plugged-in beat writers can. b. Cyd Zeigler of Outsports with former Patriots and Chiefs tackle Ryan O’Callaghan’s heart-wrenching coming out story. c. Brian Burnsed for SI.com with the story of Clinton Portis’s financial ruin. I mean, just take a gander at this lede: Fortune pilfered, Clinton Portis contemplated revenge under the veil of darkness. On a handful of late nights and early mornings in 2013 he lurked in his car near a Washington, D.C.–area office building, pistol at his side, and waited for one of several men who had managed a large chunk of the $43.1 million he earned with his 2,230 carries over nine NFL seasons. d. Natalie Weiner of Bleacher Report, doing some fine legwork and coming out of an uncomfortable interview with Greg Hardy with a salient take on the NFL’s relationship with domestic violence. e. Bomani Jones for The Undefeated with a potent takedown of the anti-Kaepernick crusaders in and out of the NFL. f. Seth Wickersham of ESPN the Magazine turned in a thorough examination of the bubbling discontent in Seattle. g. And finally, the boss, Peter King, with a sadly necessary exit interview with former Milwaukee Journal Sentinel NFL writer Bob McGinn. b. This on-air takedown of former Bills corner Stephon Gilmore by WGRZ Buffalo host Jonah Javad, one of the best examples of how fun and essential local journalism can be. There’s nothing wrong with a little hometown boosterism when it’s this funny. 4. I think Eric Dickerson is trolling us when he says he believes Sean Mannion should start over former No. 1 overall pick Jared Goff in Week 1. "For me, my guy that I would start the season with is Sean Mannion," Dickerson said last week on The Herd. "I've been saying that since last year. Give him a shot. You drafted him. He was great at—where'd he go to school?—Oregon State, playing in a pro-style offense. He's a big guy, got a great arm." Going after longtime head coach Jeff Fisher was one thing, but trying to insert a QB controversy where there is none does no favors for first-time head coach Sean McVay, who has plenty on his plate already. Enough with the armchair coaching. 6. I think Ezekiel Elliott should take this free advice: Stay away from bars. Get in your playbook and thank the football gods that you were drafted with Dak Prescott onto a team with one of the premier offensive lines in the NFL. 7. I think the Chargers might be cursed. Here is just a brutal factoid from ESPN’s Field Yates: “The Chargers haven't had a first-round pick play 16 games as a rookie since Melvin Ingram in 2012. Now, Mike Williams might miss the season.” Williams has since denied reports he required back surgery after suffering a mild disc herniation in rookie minicamp, saying “everything is good.” Here’s hoping the former Clemson receiver is right. 8. I think Le'Veon Bell's quest to be paid like a No. 1 running back plus a No. 2 receiver is novel though ultimately flawed. Setting aside the fact that Bell has played just one full 16-game season in four years in Pittsburgh; the durability question inherent to the position prevents any team, much less the uber-cap conscious Steelers, from setting a new market for dual-threat running backs. No. 2 receivers don't run between the tackles and get their legs caught under piles of bodies, which is why a solid No. 2 receiver is a better investment than your average No. 1 running back. 9. In putting together a top 10 head-coaching candidate list for publication later this week, I keep hearing one surprising name over and over: Mike Vrabel. The former Steelers, Patriots and Chiefs linebacker only retired in 2010, but he’s made quite the impression on several of the NFL personnel executives I’ve surveyed so far. After just three seasons coaching linebackers with the Texans, Vrabel’s popularity is right up there with names like Jim Schwartz, Steve Spagnuolo and Harold Goodwin in terms of head-coaching hype. A top-10 finish for the Texans defense in his first season as coordinator would all but guarantee him serious consideration for every head coaching opportunity next year. 10. My dear friend and valued colleague Emily Kaplan heads off for icier pastures this month, leaving The MMQB for the NHL beat at ESPN. As avid Twitterers, we shared a love of the social media habits of one of the site’s friendliest users, Amy Trask, the former Raiders CEO with the best nickname in sports executive history, “Princess of Darkness.” Trask faithfully concludes most of her tweets with the sentence, ‘And, hi.’ Kaplan and I adopted the phrase in texts—e.g. What in the hell was Peter talking about on that conference call? And, hi. We dreamed of a sprawling 3,000-word double byline feature story on the And, hi phenomenon, its origins, applications and the mastermind behind it. That dream is dead now, because Emily murdered it, but I did finally ask Trask what all the hi’s are about.